Afterschool for All Challenge Speaks to Officials in D.C. Recent Lawrence High School Grad Jazmyne McNair Returns to Kansas After Sharing Views on Afterschool Programs with Officials in Washington, D.C.
Washington, D.C. – Jazmyne McNair, who recently graduated from Lawrence High School and attended The Boys & Girls Club of Lawrence afterschool program, spent part of this week meeting with U.S. Senators and Representatives and their aides to discuss the importance of investing in afterschool and summer learning programs for youth. Jazmyne is one of just six afterschool students from five states selected to travel to Washington, D.C. for the annual Afterschool for All Challenge, organized by the Afterschool Alliance. 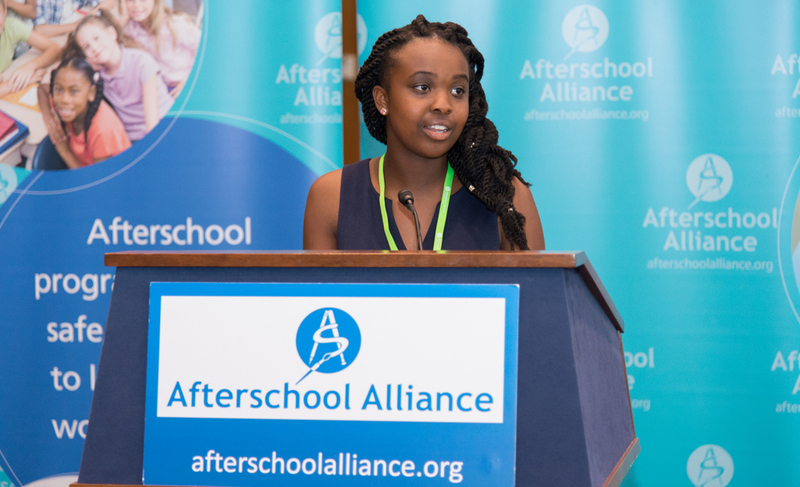 On Wednesday, Jazmyne shared her experiences and perspectives on afterschool programs with members of Congress, emphasizing the ways afterschool programs help young people get prepared for college and careers. Jazmyne’s trip was in collaboration with the Kansas Enrichment Network and the Afterschool Alliance. She received a full scholarship to Coe College in Cedar Rapids, Iowa, where she will enroll in the fall. Jazmyne is currently working for the Boys & Girls Club of Lawrence this summer, last year she was named Boys & Girls Club Kansas Youth of the Year and recognized at the State Capitol. The Afterschool for All Challenge is an annual event that brings together afterschool program providers and experts, along with students, to showcase some of the innovative activities their afterschool programs provide. Afterschool providers, educators, community leaders, parents and youth from nearly 40 states visited Washington, D.C. this week as part of the Afterschool for All Challenge. Congress will soon begin working on the federal budget for the next fiscal year; President Trump is proposing to eliminate federal funding for afterschool programs in 2018. Participation in afterschool programs has increased to 10.2 million students nationwide, up from 6.5 million in 2004, according to the America After 3PM household survey of 30,000 U.S. families, commissioned by the Afterschool Alliance. But the unmet demand for afterschool programs has increased as well. Today, for every child in an afterschool program, there are two more whose parents say they would participate, if a program were available. One in five students in the country today is unsupervised after the school day ends.